The human act of riding ocean waves on flotation devices has been going on for thousands of years. We, in fact, do not know how many thousands of years. It has been reasonably estimated that the act involving wooden boards could date as far back as 2000 B.C. (4000 B.P. ), before the beginning of the Polynesian migration across the Pacific Ocean. If we count canoe surfing, the act must be far older than that and if we include bodysurfing, then we must consider the span of time in terms of tens of thousands of years. 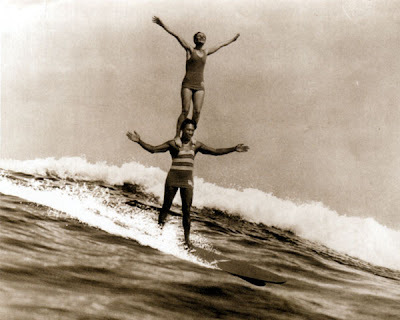 Surfing on boards – he’e nalu – rose to a high level of development in the Hawaiian Islands sometime after Polynesians first settled the Hawaiian chain beginning around 300 A.D. (2300 B.P.). “Wave sliding” using boards – along with canoe and body surfing – not only became important parts of the lifestyle of all Hawaiians prior to European contact in the later 1700s, but was also integrally connected with Hawaiian culture. In stark contrast to this “golden age,” surfing fell to an almost ignominious near-death during the 1800s – mostly due to European and American cultural, political and religious influences. In 1919 Louis Whyte, a Geelong businessman, and Ian McGillivray visited Hawai’i and purchased solid redwood boards from Duke Kahanamoku. The boards were subsequently ridden at Lorne Point, Victoria. At the 1924 the Australian Championships at Manly, the surfboard display was won by Charles Justin “Snow” McAlister of the Manly Surf Club. As a kid, he had watched Duke ride in 1915. Thereafter, Snowy soon began surfing on his mother’s pine ironing board. “I used to wag school and rush down to the beach with it,” he recalled. 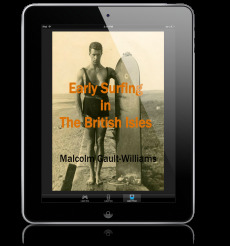 “I got away with it a number of times, but she eventually found out because I would come home sunburnt.” The pine ironing board was followed by a self-made plywood board and his first full size board, a gift from Oswald Downing. Later, Snow made his own solid redwood board. “I used to go into the timber yards in the city and buy a ten by three foot piece of wood about two feet thick (sic, inches? ), which I had delivered to the cargo wharf beside the Manly ferry. Starting out on an impressive competitive record, Snow McAlister won board displays in Sydney in 1923-24 (Manly), 1924-25 (Manly), 1925-26 (North Bondi) and 1926-27 (Manly, second Les Ellinson). Not originally intended for surfers, the cement jetty at Corona del Mar was a boon for surfriders. The 800-foot long jetty stretched from the rocks at Big Corona all the way to the beach. When the swells were running, a surfer could launch from the end of the jetty, ride in next to it for approximately 800 feet, then climb up a chain ladder, run out on the jetty and do the same thing all over again. Perhaps more importantly, waves jacked up at Corona unlike they did anywhere else – also due to the jetty. More important than the results of who won what, the big story of this first-ever surf contest on the U.S. Mainland was the first-ever unveiling of the hollow surfboard in competition. Tom Blake brought his drilled-hole hollow board innovation and a regular 9-foot 6-inch redwood surfboard back with him by boat from Hawai’i. Armed with his partially hollow olo replica, Tom subsequently won the first Pacific Coast Surfriding Championships – which he had also helped organize. The Pacific Coast Surfriding Championships became an annual event, dominated for 4-out-of-9 years by Preston “Pete” Peterson, who reigned as California’s recognized top surfer throughout the 1930s. Other early winners of the trophy included Keller Watson (1929), Gardner Lippincott (1934), Lorrin “Whitey” Harrison (1939) and Cliff Tucker (1940). 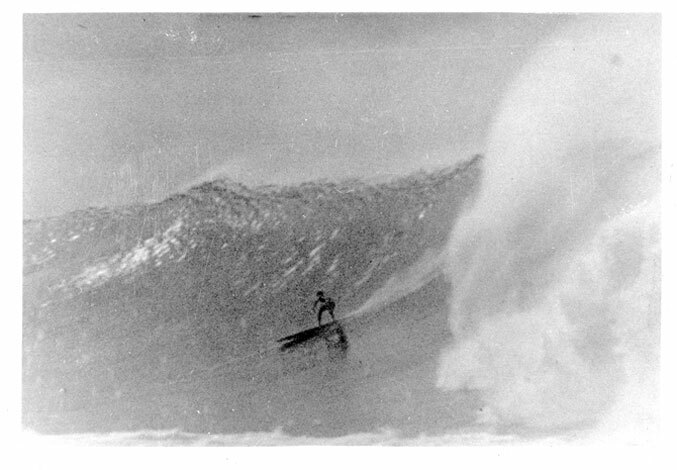 Following his win of the first Pacific Coast Surfing Championship at Corona del Mar in 1928, Blake took his hollow board back to Hawai’i with him and took on the famous races held at the Ala Wai Canal annually. By this time, he had given up on filled-in drilled holes in favor of a hollowed-out chamber approach. “The appearance of the smoothness of the cigar-shaped board, and the quiet, reserved and impressive showing of its maker and paddler, Tom Blake, attracted more than usual interest. Everybody wanted to use that type of board and the success and speed of this board showed itself in the number of races that were won by the individuals using it. “Reverberations of the ‘hollow board’ tiff were heard from one end of the Ala Wai to the other,” recalled Sam Reid around 1955, “and echoes can still be heard at Waikiki even today – 25 years later. At a meeting of the three (surfing) clubs, Outrigger, Hui Nalu and Queens, held immediately after the disputed races… it was decided that… there would be no limit whatever on (the design) of paddleboards.” It is a sad fact that much resentment over his lightweight designs remained after Tom’s Ala Wai wins. Because of the 1929/1930 Ala Wai controversies, Tom only entered the race one more time, the following year. Impressively, Tom’s half-mile record of 4:49:00 stood until 1955. It was broken by George Downing, who covered the course in 4:36:00 on a 20-foot hollow balsa board. Blake’s board had been a 16-foot hollow redwood. Other long-standing records held by Tom include the world’s record for the 1/2 mile open and 100 yard dash in paddleboard racing. They were held for twenty-five years. Wells, p. 159. Snow McAlister quoted.